Unique designs of handcrafted jewelry in average and PLUS sizes. Here you will find lovingly handcrafted jewelry made with semi-precious gems and precious metals and hand made glass beads. I prefer to use natural stone for its organic beauty. Discover a wide selection of earrings, bracelets, necklaces and ankle bracelets with color combinations found in and inspired by nature. Most pieces are adjustable to fit most women - average to PLUS size! 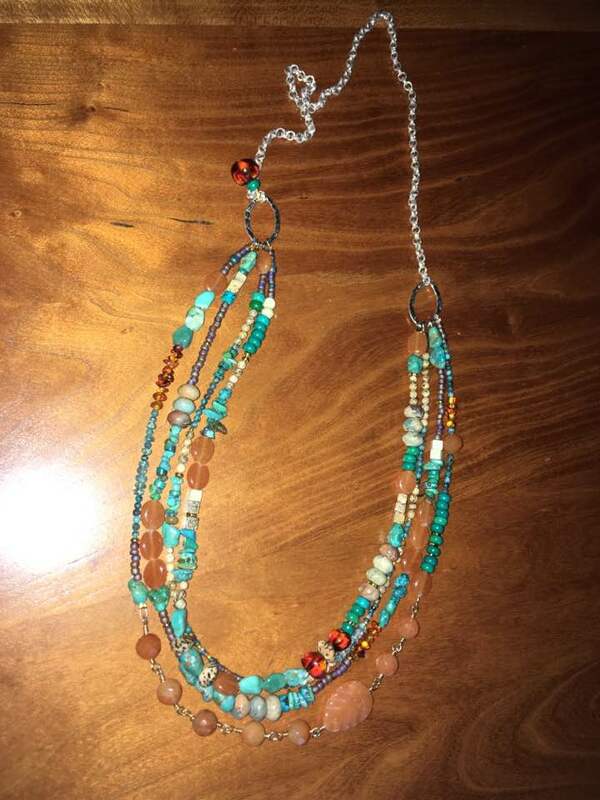 Look for the next to bracelets 8" or longer and necklaces 18" or longer to fit more generously sized women. Or I can custom adjust it to your specifications. If you're not happy with your purchase, you may return it for an adjustment, repair or refund. Just click on one of the images above and it will take you to a list in each category. I can also custom design a piece for you. How about matching necklaces for your bridal party or a personalized piece using your loved one's birthstone? Just Email Jana and tell me what colors and stones you would like and we can work from there! Would you like to buy a gift but can't decide on a piece? How about purchasing a Gift Certificate? You can make it for any amount and she can browse through and make her own choice. a piece made just for her exactly as she wants it to look! Buy a gift certificate through secure PayPal. Each purchase will be shipped in a gift box and a secure padded or cardboard packaging. I'm always adding more so please check often. I accept payment through PayPal! I'm VERIFIED so Buyer Protection is guaranteed. Badger Ridge Middle School, 740 N. Main Street, Verona. Email Jana if you have a question. Thank-you! Recycled Threads - Plus sized designer clothing. Great with BB Jewelry! National PTA - every child. one voice.